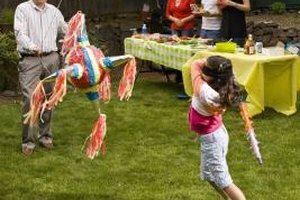 Make it a sweet and festive event with a candy-filled piñata. While the thought of a cookout conjures up images of grilled foods and cool drinks, there's so much more to enjoy than just the menu. Keep your youngsters entertained with activities that every guest can join in on, and when it's finally time for the food, everyone will have worked up a healthy appetite. A cookout just isn't complete without some decorative crafts to adorn the patio, backyard or campsite. Make some paper flowers ahead of time to adorn each picnic table, thread silk flowers onto yarn to make floral garlands for outdoor umbrellas or along the fence tops or make some leis for a luau-themed cookout. Before you get the fires stoked for dinner, help your little munchkins get some energy out with some fun family games. You can warm up with a simple game of lawn darts, but make sure you've got a set with child-friendly ends instead of points. If you've got a large crowd at your cookout, organize a child-friendly game of capture the flag or football. When you're gasping for breath and your preschoolers are still roaring to go, hand over some inflated balloons and see who can pop the most. If you've got toddlers at your cookout, skip the balloon game and move on to other activities instead to avoid dangerous latex pieces on the ground. If you've still got some energy left in you, get everyone involved in a burger-patty relay race. Make some fake hamburgers ahead of time from cardboard or modeling clay. Have each little tyke and adult race from the starting line to finish line carrying a patty on a spatula -- first one across wins. You can change up the game and see how many each player can get in a box before time runs out. If you didn't have time to make the patties, that's okay – have a traditional egg-and-spoon race instead and see who makes it to the finish line with the egg still intact. Prepare a written or pictorial list ahead of your cookout filled with items to find around the backyard or campsite. You can include things like particular types of leaves, a caterpillar, rocks, flowers and weeds. Send your little tykes out scavenging to find every item on the list. If your munchkin isn't reading-ready quite yet, host a different type of scavenger hunt. Collect a few paint swatch cards in different colors and have your little guys search for items around the yard or campsite that match the swatches. Set up a water sprinkler to keep your little group cool on a hot summer's day. If you don't have one, or a sprinkler's just too mundane for your taste, prepare for a water balloon battle in a fierce fight to the most-drenched. When you have toddlers around, you may want to skip the water balloons in lieu of something gentler. Make some water sponge balls and provide your munchkins with buckets of water to keep the balls wet. You can make the balls easily from sponges cut into strips. Gather six to eight strips together in one hand and cinch them through the middle with a zip tie. Cut off the excess tie and voila – you have soft, water-absorbing balls for a soaking good time on a hot day. Use a cookout as an opportunity to introduce a variety of different foods to your little munchkins. In addition to the traditional fare of hot dogs and hamburgers, you can grill up some veggies, such as squash, tomatoes, and green and red peppers. If you have picky eaters who won't go near a hamburger, make some custom pizzas on the grill, decked with everybody's favorite toppings. For dessert, introduce the family to the wonders of grilled pineapple, strawberries and bananas served over ice cream or pound cake. Great Big Book of Children's Games: Over 450 Indoor & Outdoor Games for Kids; Debra Wise et al.